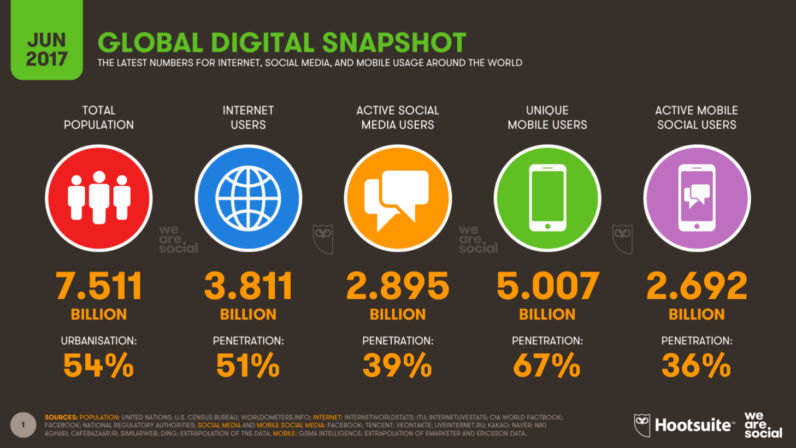 The latest snapshot in We Are Social and Hootsuite’s series of reports on digital use around the world reveals some important trends in people’s behaviour. The overall trend is still one of strong growth, but there are some surprises behind these numbers too. The top headline in digital this week is the announcement by GSMA Intelligence that there are now more than 5 billion unique mobile users around the world. These latest numbers mean that global mobile penetration has passed the two-thirds milestone, with 67 percent of the world’s total population now using a mobile device. Meanwhile, the latest update from Ericsson indicates that smartphones now account for 55 percent of all mobile subscriptions, and my calculations based on this suggest that more than half of the world’s total population now uses a smartphone. Smartphones accounted for 80 percent of all handsets sold around the world between January and March this year too, so their influence is likely to accelerate further in the coming months. Average mobile connection speeds are significantly up as well. Ericsson report that mobile broadband subscriptions grew by 25 percent in the year to March 2017 to reach 4.6 billion, and now represent more than 60 percent of all global subscriptions. However, the latest numbers that Facebook are reporting to advertisers show a slight drop in monthly active users. This isn’t unusual at this time of year – Facebook’s numbers have shown similar patterns in the past couple of years – but it’s worth noting that the total number of active Facebook accounts around the world is down by 50 million, or 2.5 percent, since its high point of 1.968 billion a few months ago. Based on historical patterns though, it’s likely that this dip is just a ‘seasonal blip’, and Facebook’s user base will likely return to its growth path towards the 2 billion user mark in the coming weeks. Many of Facebook’s top markets are actually showing strong growth, too; the number of active accounts in the United States is up by 11 million (five percent increase) since April 2017 to reach 230 million, while Indonesia posted similar growth in the same period, up five percent to reach 117 million active accounts by mid-June 2017. Meanwhile, social media growth continues unabated in China, with the latest figures from Tencent indicating that more than 870 million people in the country now use Weixin, the platform known as WeChat in the English-speaking world. And, as if that figure isn’t impressive enough already, Weixin users in China have surged by more than 80 million in the past 6 months, delivering growth of more than 10 percent over the past two quarters. North Asian countries continue to forge their own path, with LINE in Japan and Kakao Talk in South Korea both increasing their domestic user bases, despite registering declines abroad. LINE reported 68 million active users in Japan in its Q1 earnings report, whilst Kakao announced 42.4 million active accounts on its Kakao Talk platform in South Korea in its most recent earnings announcement. VK (also known as VKontakte) has posted gentle growth in its Russian user base over the past two months, with our latest calculations suggesting that more than 60 million Russians used VK in the past month. However, VK is now largely blocked in the Ukraine – previously the platform’s second-largest market – which may slow VK’s overall growth in the coming months. Facebook has been quick to seize this opportunity, posting strong gains in the Ukraine in VK’s absence. Active Facebook user accounts in the country are up by 20 percent – or 2 million users – since the start of 2017. It shouldn’t be news to marketers that mobile needs to be at the center of their digital plans, but the opportunities offered by mobile continue to evolve rapidly. Smarter devices, faster connections, and bigger, sharper screens mean that marketers everywhere can now embrace video, safe in the knowledge that the majority of their audiences can now stream video at an acceptable level of quality. Mobile marketing isn’t just about advertising content, though; more and more people are integrating mobile into every aspect of their daily lives. That’s why businesses need to look at the broader mobile environment to identify opportunities to deliver new kinds of products and services through these devices, and not just deliver new kinds of marketing. The changes in the social media landscape have implications for marketing too. While we shouldn’t be too worried by the slight dip in Facebook’s user numbers, it’s clear that people are increasingly spreading their social media behaviour across a wider variety of platforms, and marketers need to adopt a more ‘platform agnostic’ approach to content and engagement if they’re to keep pace with their audience’s habits and preferences. To address this, my recommendation is to put renewed emphasis on organic audience sharing, and not to stake everything on paid media activities.